Brest pod Učkom is a quaint village located entirely within the borders of Učka Nature Park at a height of 708 metres above sea-level amidst a fertile field on the Ćićarija plateau. The people here were once famous for producing charcoal. The forest was their main source of income: it provided the firewood for their homes, but also for producing charcoal, which they would then sell in Opatija, Rijeka, Lovran and other places along the coast. In addition to arable farming and cattle-breeding, the main occupation of the local people was the production of charcoal in piles called “karbunice”, from which even today one can see smoke rising. To sample or buy some home-made sheep’s milk cheese, ask local people for the Rumac brothers. These brothers make their cheese and curd cheese from the milk of the indigenous Istrian sheep breed called pramenka, and their flocks graze freely on the pastures of Ćićarija. The quaint village of Brgudac is located in the heart of the Ćićarija mountain range at an elevation of 747 m above sea-level, which makes it the highest permanent settlement in Istria. This place, whose history dates back to the Middle Ages, used to teem with life: in the past, more than 400 people lived here, and had up to 3,000 cattle. But due to its later economic conditions and turbulent history, Brgudac’s people had to scatter all over Croatia and abroad. Many of them, however, return here regularly to take care of their heritage and preserve the beauty of this village. 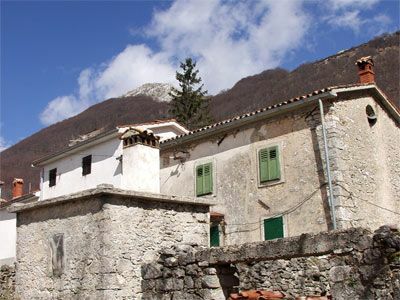 During World War Two, Brgudac was the centre of partisan activities in Istria, and is remembered for the suffering and heroism of it people. 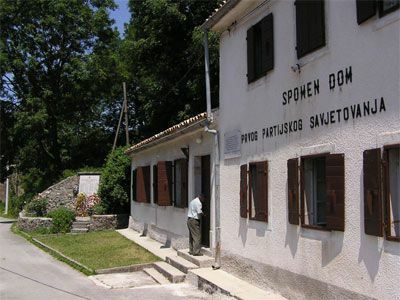 On the 10th of October 1942, the first rural people’s liberation committee (a self-government body) was founded here, and in December 1943, Brgudac had the first Croatian school in Istria after the fascist ban from 1923. Today a dozen memorials remind visitors of this hard period, most striking being the one that memorises 19 murdered partisans and 37 civil victims of the fascist terror. Brgudac is the starting point for a hiking route that leads to the Korita water source area and further on to the peak of Veli Planik. Lovranska Draga is a picturesque village located within the borders of Učka Nature Park on the eastern slopes of Mount Učka. Until around twenty years ago, its local people engaged intensively in agriculture, especially wine-growing, cattle-breeding, and sheep farming. In addition to vines, the area’s fertile soil was also used to produce different types of fruits and vegetables, predominantly cherries and sweet chestnuts. The small, scattered houses are connected by a network of ancient paths, the most important being those that lead from this rural hinterland of Lovran to Medveja and the sea. In the past, the women of Lovranska Draga would walk these paths every day carrying firewood, milk and vegetables to Lovran. At the entrance to Lovranska Draga is the small baroque church of St. Michael, patron saint of the village. The church is surrounded by terraces with vineyards and meadows. 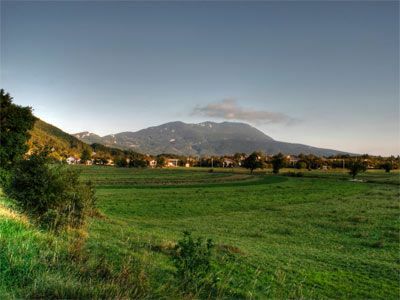 Together with the peak ridge of Mount Učka in the background, this place makes up a particularly valuable landscape. A stream, locally called simply Potok (which means stream or brook in Croatian), runs through the village and flows into the sea in Medveja. The most interesting part of this stream is its waterfall, one of the most beautiful waterfalls in Učka Nature Park. It can be reached on the marked Slap educational trail(Slap means waterfall in Croatian). On the 29th of September, local people celebrate the feast of St. Michael, the patron saint of Lovranska Draga. On this feast day, Lovranska Draga hosts a folk festival where visitors can enjoy one of the traditional dishes of the region – turnip and beans. In the Lovranska Draga area, at the site called Oporovina, remnants of prehistoric man were found in 1929. This was the first prehistoric site on Kvarner. Mala Učka is the highest rural settlement in Istria, located at an elevation of 995 metres above sea-level. 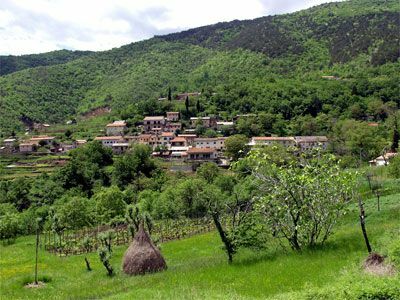 In the past, this village used to have 130 inhabitants (locally called Učkari) who engaged in cattle breeding and were famous for their high-quality cheese. During World War Two, on the 30th of April 1944, Italian and German soldiers burned down the entire village. After the war, the remaining inhabitants moved out due to the harsh economic situation. Despite this, the village remained so quaint and picturesque that it was listed in the Registry of immovable cultural monuments in 1976 as a protected rural unit. Today the village of Mala Učka has no permanent residents, but every year in the summer months, the Maliki, a shepherding family, come back to take full advantage of the area’s high-quality pasturing. Visitors can buy some excellent sheep’s milk cheese and curd cheese at their house. 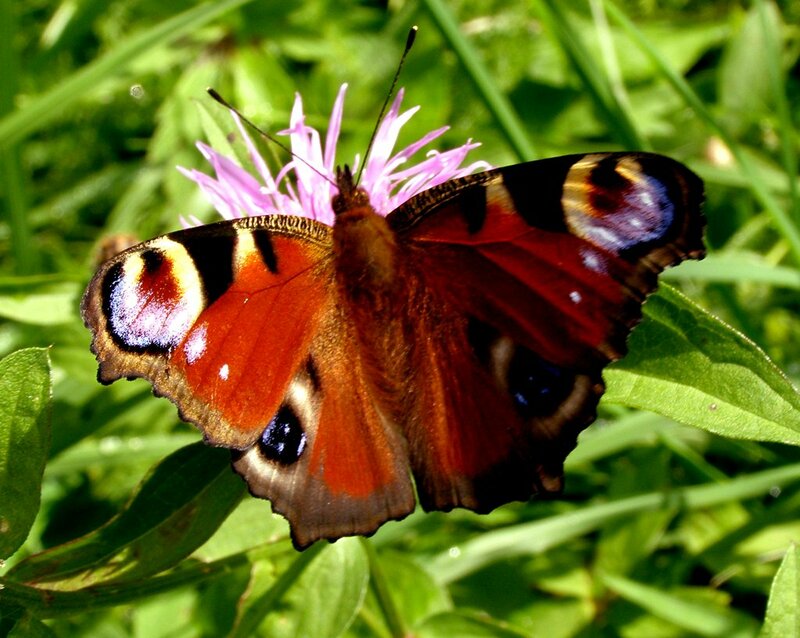 The diversity of Mala Učka’s flora and the beauty of its relief and rural landscape, with the village surrounded by mighty rocks and pastures, represent an extraordinarily valuable natural heritage. To reach the village, take the gravel road from the village of Vela Učka. Vela Učka is a rural settlement on the highest slopes of Mount Učka. It is located at an elevation of 950 metres above sea-level, which makes it the second highest settlement in Croatia.